A fragrant, fresh, and crunchy salad that takes its inspiration from the traditional tabbouleh that is a popular Levantine salad. 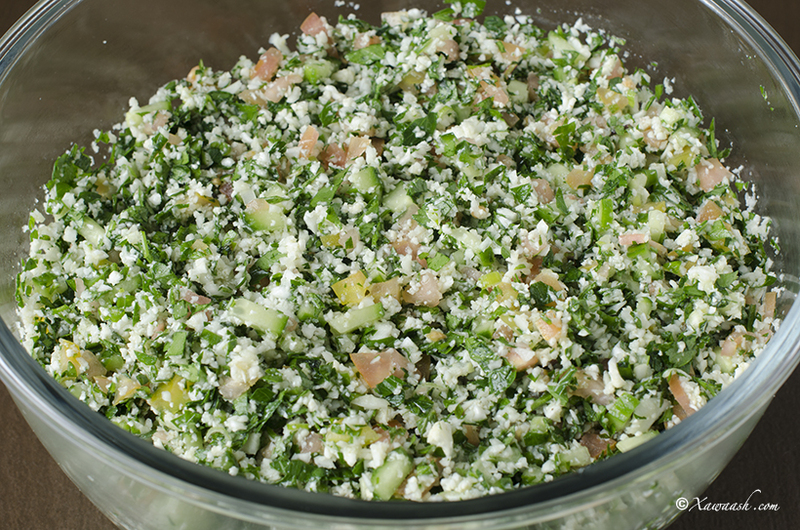 Traditional tabbouleh is made with bulgur wheat and different regions use different proportions of it in the salad. Instead of bulgur, we decided to use grated cauliflower which made the dish even more refreshing. 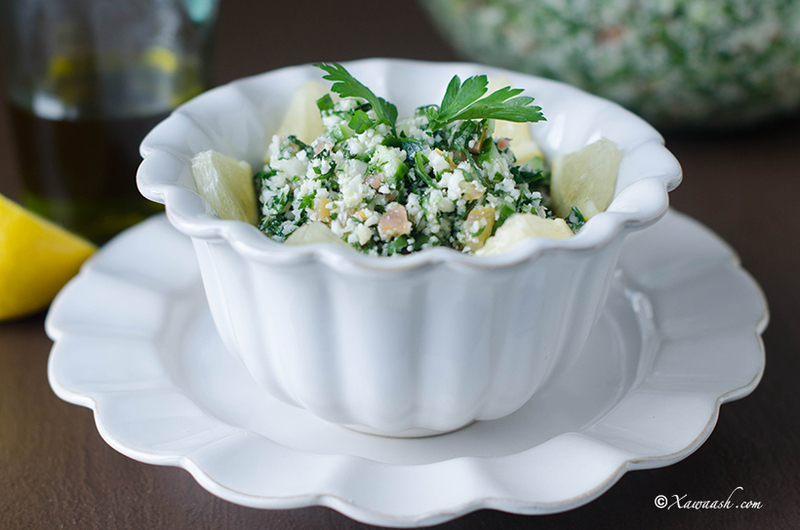 Cauliflower tabbouleh is also gluten-free. 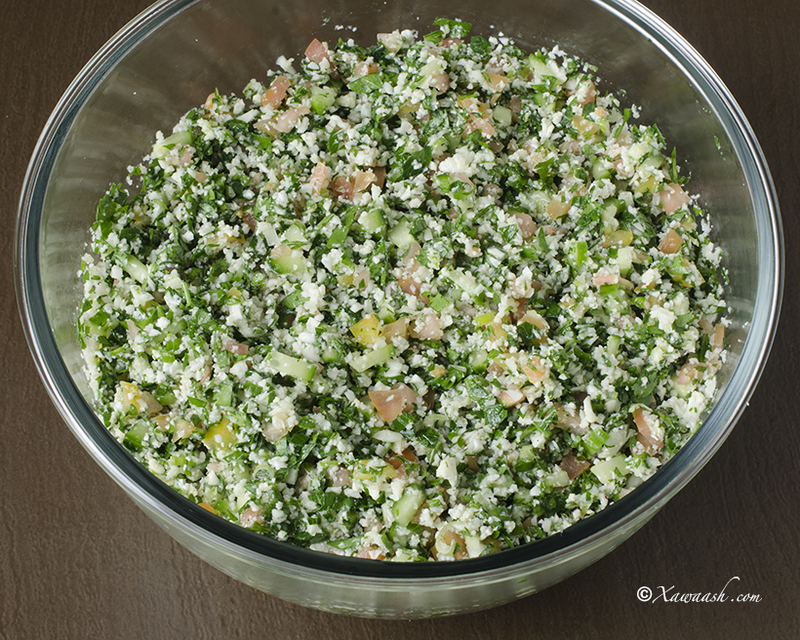 In our home, this tabbouleh is very popular and it is the reason why we always make a large batch as it rarely makes it to the next day. This salad is very filling, healthy, and will not mess up your diet. 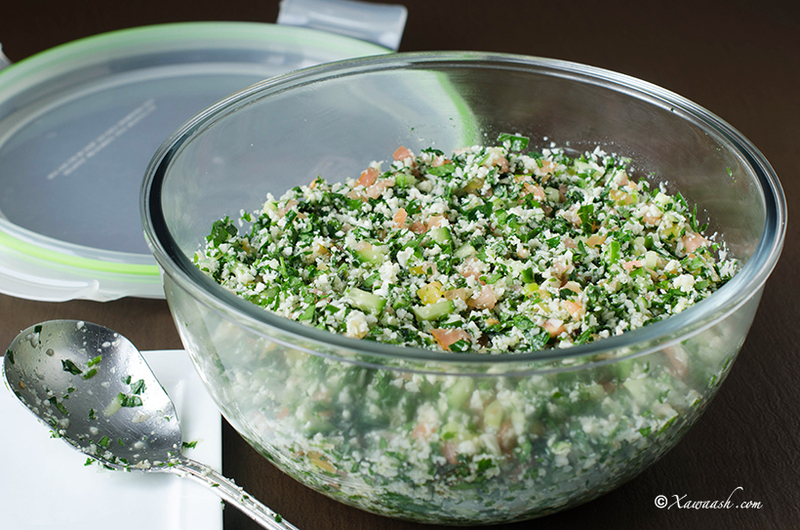 Unlike mutabbal (eggplant dip) and baba ghanoush that taste better the next day, tabbouleh is best eaten when fresh. We suggest making a batch that you can finish. 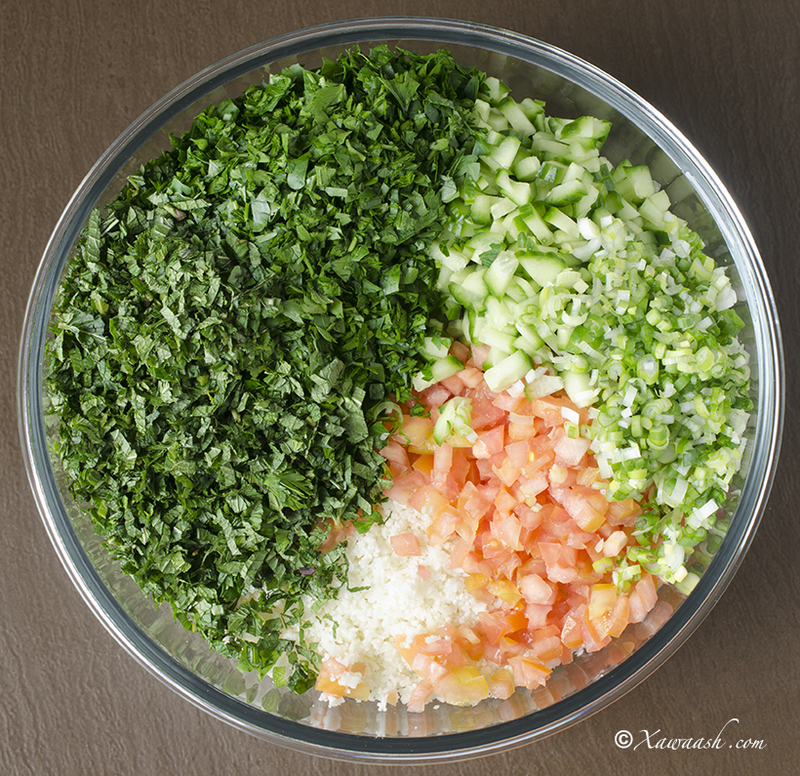 If you wish, you can grate the cauliflower and chop parsley, mint, green onions, and cucumbers ahead of time then assemble and add the chopped tomatoes and the dressing when ready to serve. 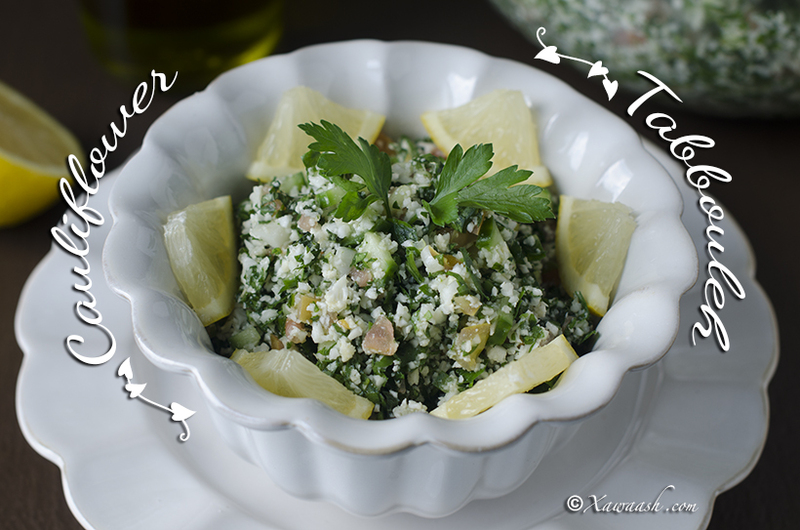 You can serve tabbouleh as a side dish, scoop it onto lettuce leaves, or serve with falafel and pita bread. Whichever way you serve it, we are sure you will enjoy it. Cut the cauliflower into florets. Wash and pat dry. 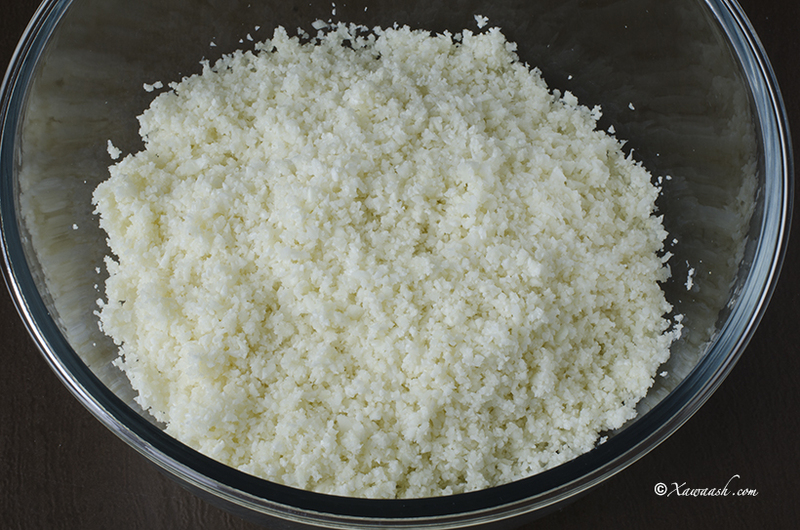 In a food processor, pulse the cauliflower 5 to 6 times or until finely chopped. Do not process too much and turn it into a paste. Pulse in batches. Add the chopped tomatoes, cucumber, parsley, mint leaves, and green onions. Add the lemon juice, olive oil, white vinegar, salt and black pepper. Stir and combine well. Keep refrigerated until when ready to serve. Qarnabiitka gabalo yaryar u jarjar. Dhaq, kaddibna qallaji. Makiinadda ku rid. 5 ama 6 jeer guji battanka “pulse”. Aad ha u shiidin. Marba qaar shiid. Ku dar yaanyada, qajaarka, baqduuniska, meentada iyo basasha cagaaran. Ku dar liin dhanaanta, saliidda oliifada, qalka, cusbada iyo filfisha madoow. Walaaq oo si fiican isku qas. Qaboojiyaha geli ilaa laga qaddimo. Une salade parfumée, fraîche, et croquante qui s’inspire du taboulé traditionnel, la populaire salade Levantine. Le taboulé traditionnel est fait avec du boulgour, utilisé en proportions différentes suivant les régions. Nous avons décidé d’utiliser du chou-fleur à la place du boulgour ce qui rend le plat encore plus rafraîchissant. Le taboulé de chou-fleur est en plus un plat sans gluten. A la maison, le taboulé est très populaire et nous en faisons toujours en grande quantité car il ne dure jamais plus d’un jour. Cette salade est très rassasiante, peu calorique et ne ruinera pas votre régime. A la différence du muttabal (dip d’aubergine) et du baba ganoush qui sont meilleurs le lendemain, le taboulé est meilleur mangé frais. C’est pour cela que nous vous conseillons de préparer une quantité que vous pourrez finir. Si vous le souhaitez, vous pouvez râper le chou fleur et hacher le persil, la menthe, les oignons verts, et le concombre à l’avance puis les mélanger et ajouter les dés de tomates et la sauce juste avant de servir. Vous pouvez servir le taboulé en accompagnement, en garniture dans des feuilles de laitue, ou avec des falafels et du pain pita. Quelque soit la manière dont vous le servez, nous sommes certains que vous l’apprécierez. Séparer les fleurets du chou-fleur. Laver et sécher. Mettre le chou-fleur dans le robot et utiliser la fonction pulse 5 ou 6 fois ou jusqu’à ce qu’il soit finement haché. Ne pas trop le hacher sinon il se transformera en pâte. Hacher en plusieurs fois. Ajouter les dés de tomate et de concombre, le persil, les feuilles de menthe, et les oignons verts. Ajouter le jus de citron, l’huile d’olive, le vinaigre blanc, le sel et le poivre noir. Tourner et bien mélanger. Réfrigérer jusqu’au moment de servir. Woow masha Allah. I will try this in sha Allah. Waxa kalo idin weydisanaya walalaheyga qaaliga ah. Quraac fudud o day care ka gabadheyda yar iigu qadato, cause malmahan cunadi ayey dida marna wey cunta wax ka duwan roti ayan rabay. Malin dhawed waxan usameyay panncake/malawixi o kor loga shubayay canaha qumbaha weyna ka heshay masha Allah guriga ayey ku cuntay. Lakiin daycare ka meysan kuso cunin. So hadi a awodan ina mardhow noso galisan curac fudud an waqtina qadanenin, sameneda & wax nafaqa ka buuxda. wax walba wan ku firiyay so wili wax usamenin ayan rabay in sha Allah. May Almighty Allah bless u and ur family and protect u from evil eyes ameen. Thanks alot and Jaza kumu Allahu qeyra. Walaal waad ku mahadsan tahay kalsoonida. Goobta Xawaash waxaad gujisaa meesha quraacda. Waxyaabo badan ayaa ku jira. Hadduu Eebbe idmo waxyaabo kalena waan soo gelin doonnaa. Qayr ayaan kuu rajaynaynaa adiga iyo reerkaada. I’m in love with you, the videos,blog and music. It’s a culinary, cultural and spiritual enrichment. Thank’s a lot for this sharing. You are very welcome. We are also enjoying this journey, and it is great to have good company. Thank you! The online community really do appreciate the work and effort you two have put into this blog. 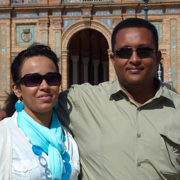 It is wonderful to see a blog about Somali food. I hope the work of people like you will help promote this cuisine and bring people back to their roots. Just a question though, how does the food in northern Somalia differ from the culinary habits of the Somalis in the south? Also, I’d love to see more unique Somali recipes! I have been looking for this fantastic recipe for a long time now, thanks for posting it! You are most welcome. We are happy you found what you were looking for in our website. Waxa aadan fahmin inoo sheeg. Aad iyo aad ayaa ugu mahadsan tahay salaanta qiimaha iyo qaayaha leh iyo faalladaada wacan. Qayr ayaan kuu rajaynaynaa. I have a question, the cauliflower is either processed in the food processor or grated by hand raw , or is it cooked?